There are two schools of winemaking in the Veneto … There are the old-school producers who make a wine that tastes like the Amarones of old. Quintarelli and Bertani are the leaders in this realm. The new, modern-style producers make a wine that’s fruity, oaky, big and bouncy. That includes, Masi, Allegrini, Zenato, and Dal Forno. Our day was a nice hybrid of the two worlds, we started with Quintarelli (considered , along with Dal Forno, the “grand cru” of the region), then off to Bertani, and finally Allegrini. 2000 Quintarelli Valpolicella, made in the Ripassa style. You may know this as “Baby Amarone”. The main thing about Ripassa is that it is much less expensive, but tastes like a lighter easier-to-drink Amarone. To do this, they ferment the grapes it with the lees of the Amarone grapes, and often they also throw some of the dried grapes into the mix, too. I would rather drink this, at 32 euro, than most Amarones on the market. 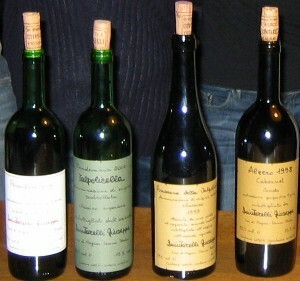 1998 Quintarelli Amarone. My tasting note: “like the most delicious Fig Newton I’ve ever had”. This is very special wine. Several years a group of us did a pretty comprehensive tasting of Amarone. We had both the Dal Forno and the Quinterrelli (both wines are over $300 a bottle). Like red and blue states, the crowd was split down the middle. Half liked the syruppy, rich Dal Forno, while the other half of us preferred the figgy, old world nuances of the Quint. 1998 Quintarelli Alzero. I really don’t understand this wine. Yes, it is delicious. But it is a Bordeaux blend aged in new oak barique. This flies in the face of traditional style winemaking! Maybe this is a statement by the Quintarelli that they don’t want to be labeled and put into a box. Either way, this wine is just a bambino and will continue to get better, that’s for sure! So after that, we went on to Bertani. As you can see from the picture below, this was NOT a modest facility! Bertani, housed at Villa Mosconi Bertani, is one of the oldest and best wine houses in the Veneto from the 1700s built OVER a winery from the 1500s! 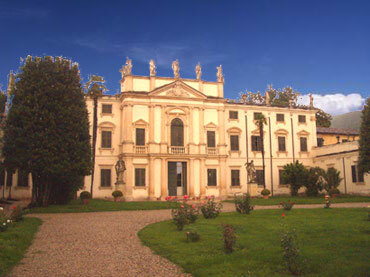 The property, now a private estate and winery, is owned by the Bertani family. We spent the afternoon touring the facility and were lucky enough to see the grapes just starting the drying process as they had recently completed harvest. It takes 3-4 months to get them dried enough so they are ready for fermenting. Bertani is one of the few Amarone houses that still uses handmade mats. They had rooms and rooms of them, with huge industrial fans blowing to keep the moisture out. 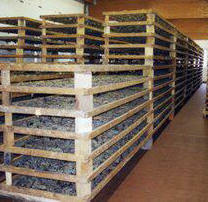 Really, it must have covered acres, and it takes hundreds of man-hours to hand-place the grape bunches on the mats. Almost all of the other producers use bins which simply stack on top of each other. Today, the estate welcomes wine tourism, concerts, and many events. View some of the pictures by clicking here. Wish I were there instead of hear! Maybe next year. Not a huge fan of Italian wines, but I tend to love Amarone–thanks for the post! excellent trip indeed! I only hear great things about your biking tours. I can’t wait to see where you go in Fall 2009. Great work Robyn. Great notes on capturing Amarone and getting Jerry into the picture, Maybe when I get in shape over the next 20 years I can come along for the ride, or who knows maybe I can be the van driver!! !